“We always have a tailwind on this ride,” Bubba tells us the night before at the riders meeting. “Sometimes it’s over 20 mph.” That’s a good sign. There’s no wind when we start, but fortunately for us, that will change. 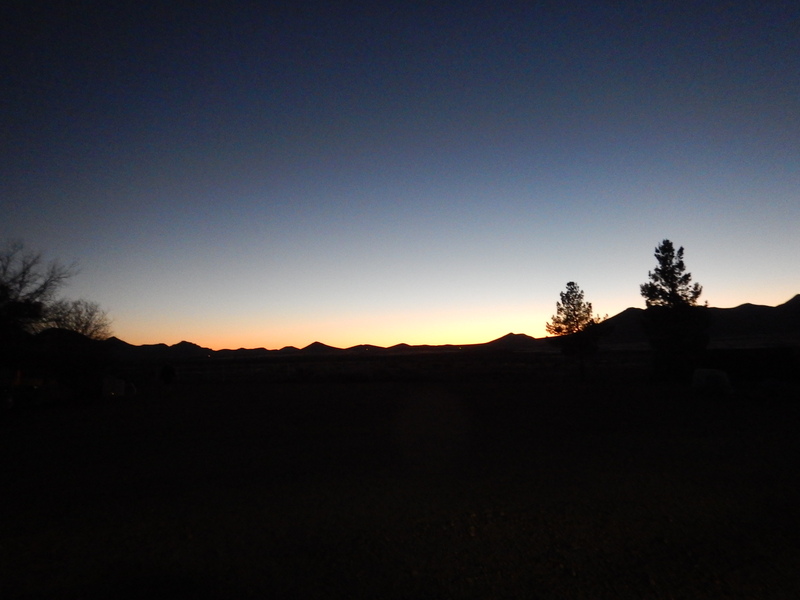 After a beautiful sunrise, we are off. This picture came out so well yesterday that we take another one today. The terrain is changing. We are losing the mountains and things are becoming a bit flatter. And very, very quiet. All we hear is the whir of the chains and the tires on the road. We are pretty lucky as most of the climbing, which is pretty easy, comes early. 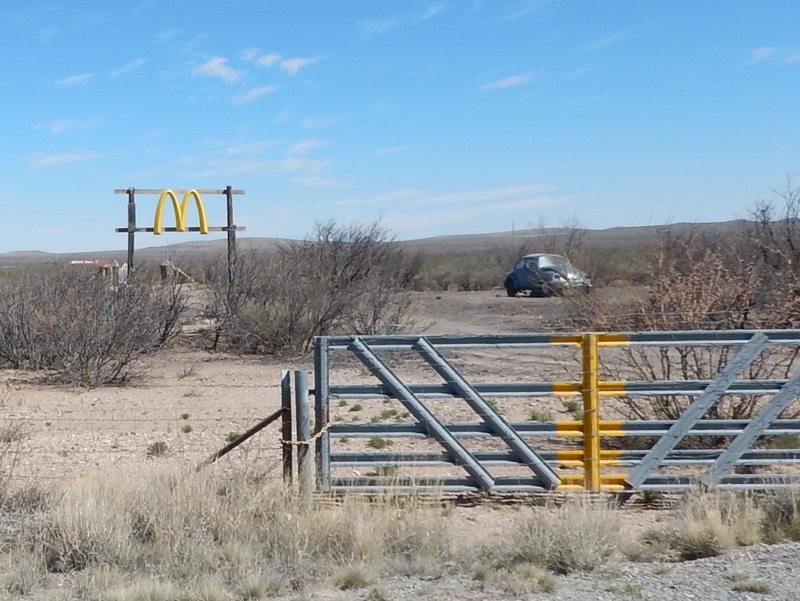 The last 40 miles are mostly downhill, and that allows us to check out some oddities, like the McDonald Ranch. 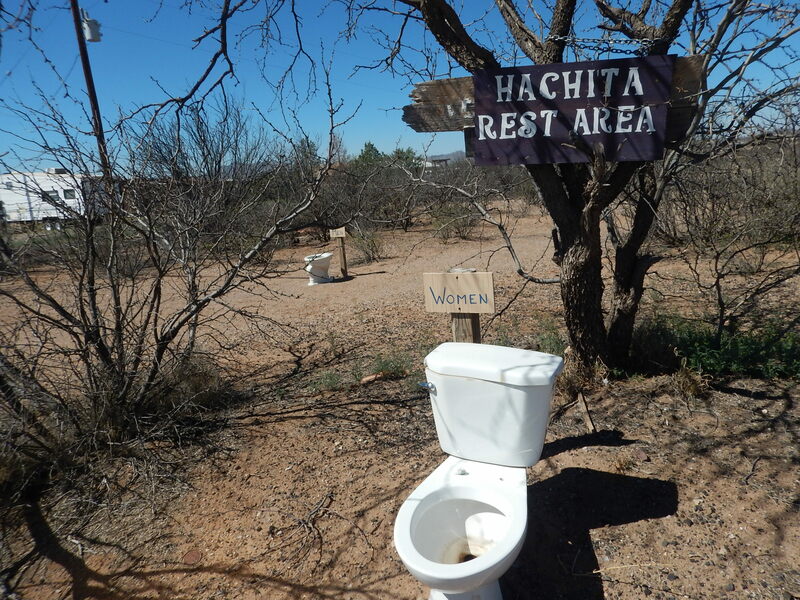 Someone in Hachita has a sense of humor. The rest of the ride flies by, probably because of the tailwind, which finally kicks in. 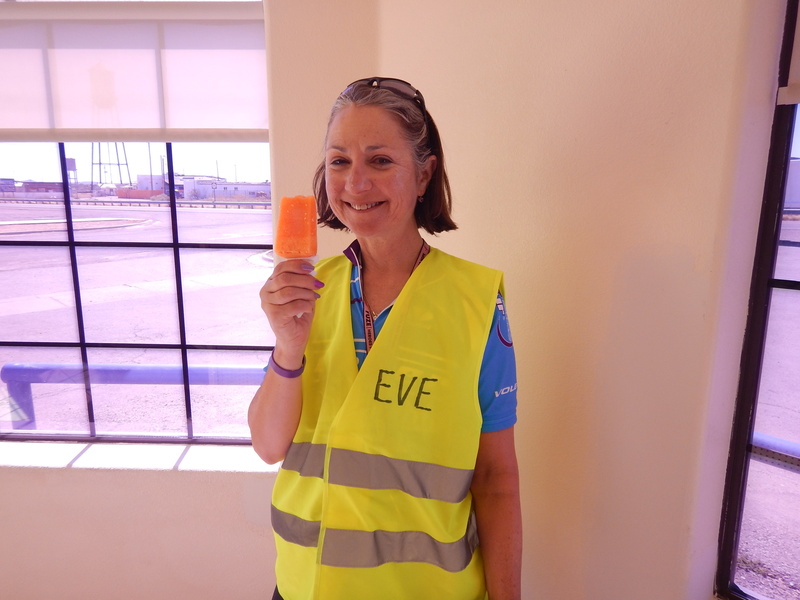 However, Eve knows there is ice cream waiting for us at the end, so maybe she kicks it into high gear for the finish. We end the day in Columbus, New Mexico, where the people are very unfriendly. They must be allergic to spandex. We can’t wait to put this place in our rear view mirror. Overall, we had a good day on the bike. 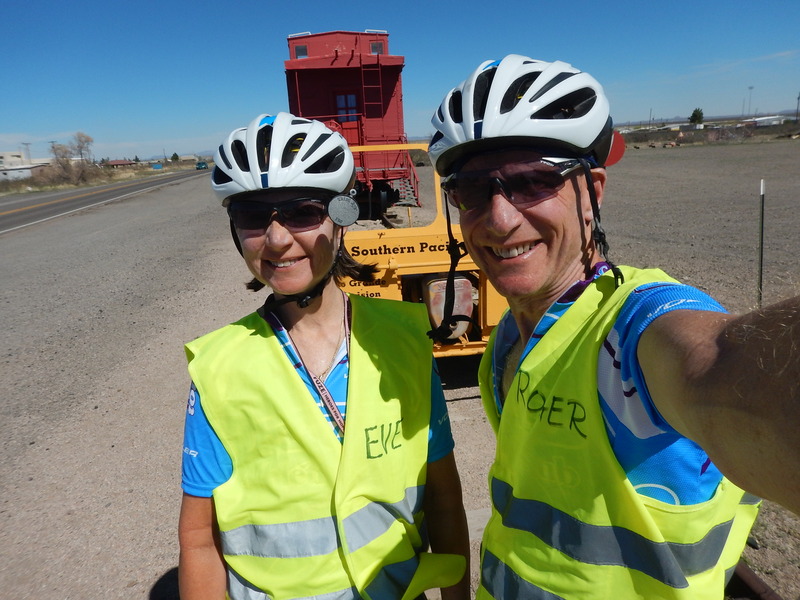 Our reward for completing our longest ride in years is a day off on Saturday. We are off to Mexico. We’ll let you know how that goes…if they let us back into the country. Note to our readers: our internet coverage is very spotty in New Mexico, so we may not be able to post for the next couple of days. The fact you both still have your big smiles is great to see! enlargements??? Was that a ” No!” I just heard??? Congrats on doing that long ride! Well done. 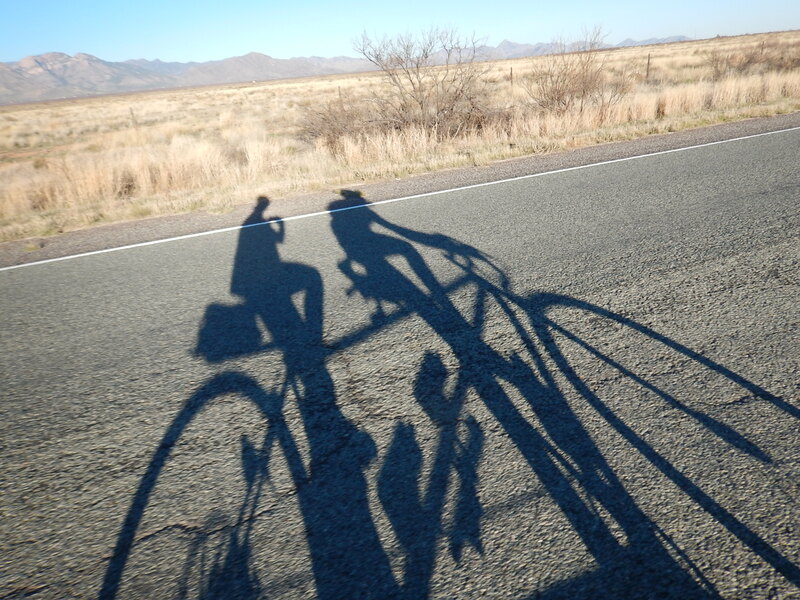 Love the tandem shadow photos. Have a great day off. We will send attorneys if you can’t get back into the USA. So glad and relieved to see this post 😜 Love your sense of humor. Day off is a good thing! I love the pictures and postings. As for the “friendly factor” of Columbus, NM… their loss. Love all the photos. Have a fun time in Mexico. Let us know if we need to send lawyers, guns, and money. 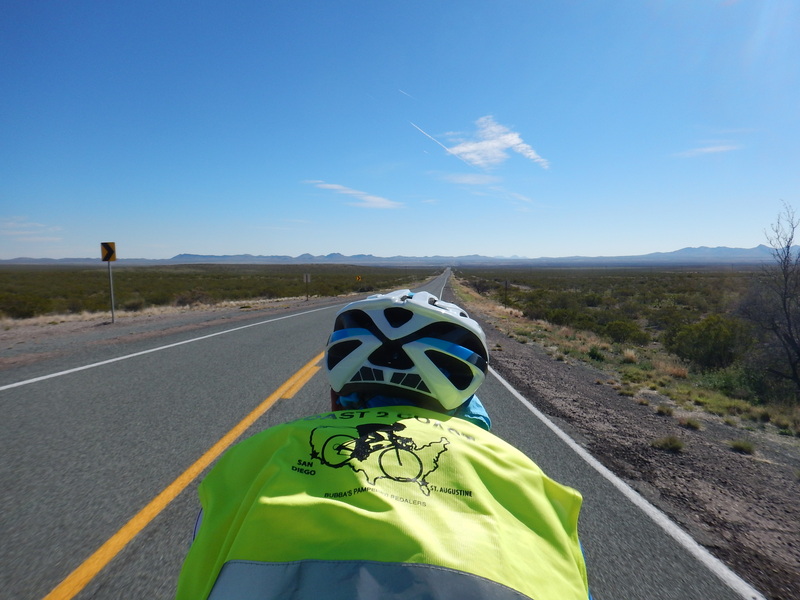 A few years back on a drive west from Austin to Tucson (in a car, no spandex, not even weird clothes 🙂 ) we noticed how unfriendly the people we encountered in that area of New Mexico were. We wondered if it had to do with dealing with interstate travelers all day long, day-in & day-out. Sounds like you are having a good time! Any bike issues so far? Wow! You continue to be an inspiration to us old married couples. Spending that much time on a bike would tax many couples literally and figuratively. I am happy for you that you have it behind you and a day off to boot. Hope your foray into Mexico is better than anticipated. I look forward to hearing more of your adventures. Call if you need bail money! What did they do or what about them makes them unfriendly? Asking for a friend. Kudos…AGAIN. Nice pace for a big ride. Hopefully you will enjoy more days of wind at your back. Yay! You did it AND posted some beautiful pictures. Thanks for sharing your Great Adventure.